Today, March 4, is Free Fry-Day at participating Chik-Fil-A locations! 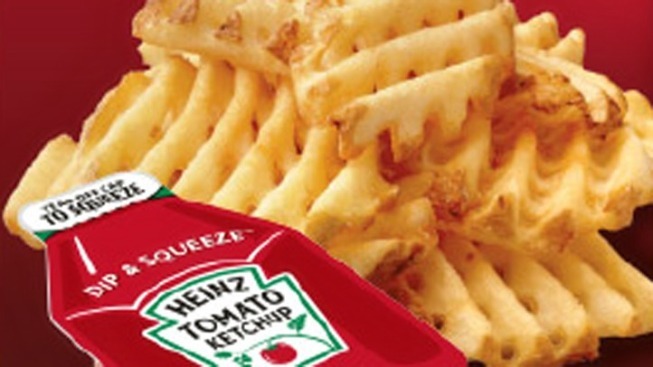 Between 2 and 4 p.m., you can get a free medium order of waffle fries when you mention you're there to the the new Heinz Dip & Squeeze ketchup. Granted, this new ketchup dispenser is a remarkably simple develpment that nonetheless is most heartily welcome. The ketchup now comes in a dip-able container similar to the ones barbecue sauce comes in. Seriously, it took humanity a looooong time to get to this. Those ketchup packets were infuriating, but don't worry. Those dark times are over now. You can use Chik-fil-A's store locator, but we suggest you call first, because not all spots are participating.We don't want you to be all psyched about getting your free fries and your ketchup miracle and then have it not work out.